A psychoactive drug, psychopharmaceutical, or psychotropic is a chemical substance that crosses the blood-brain barrier. Its action affects the central nervous system. It can affect the brain and change perception, mood, consciousness, cognition and behaviour. Hypnotics are often prescribed to help people sleep. Sometimes they are also used in rituals, or as illegal drugs. These drugs enable their users to change their consciousness. This can also help students when they are preparing their examinations. Certain therapies also use such substances. 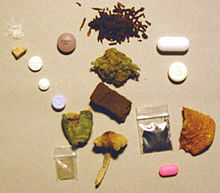 Psychoactive substances change the consciousness and mood of their user. The people using them may have pleasant feelings, such as euphoria or they may be more alert. For this reason, many psychoactive substances are abused: They are used outside the aims of the treatment. This may lead to the user developing a psychological and physical dependence ("addiction"). It will get more difficult to interrupt the cycle of abuse. Drug rehabilitation aims to break this cycle of dependency; this is done with psychotherapy, support groups and even other psychoactive substances: Acamprosate or naltrexone are examples of substances used to treat alcoholism, methadone or buprenorphine maintenance therapy in the case of opioid dependency. However, the reverse is also true in some cases, that is certain experiences on drugs may be so unfriendly and uncomforting that the user may never want to try the substance again. This is especially true of the deliriants (e.g. datura) and dissociatives (e.g. salvia divinorum). In part because of this potential for abuse and dependency, the ethics of drug use are the subject of a continuing philosophical debate. Many governments worldwide have placed restrictions on drug production and sales in an attempt to decrease drug abuse. Ethical concerns have also been raised about over-use of these drugs clinically, and about their marketing by manufacturers. This page was last changed on 20 May 2015, at 11:29.